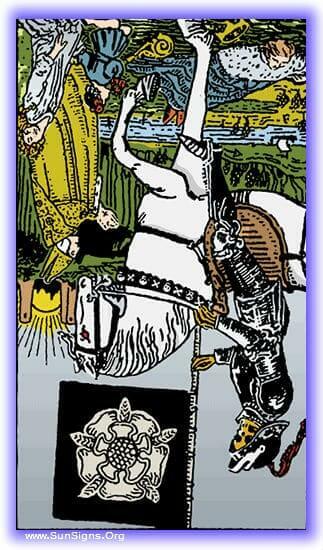 This tarot meditation of the Death card reversed will focus on the concept of violent change. It talks about the blade of death’s scythe touching on your life and taking you along with it. Painful change is the purview of this, unwelcome and devastating. As you focus on this, feel the fear of change, the rumble of hurricanes and the torrents of fires out of control. You will find yourself upon a cliff-face overlooking the ocean. The waves are crashing heavily upon the rocks below, and the skies are a steely angry grey. In the distance you see the oncoming funnel of a hurricane. Its whipping and howling its way across the briny deep towards the shore. Turning your head to the shore you can see a small town overlooking the ocean. The wind has already done it’s damage there, tearing the roofs off the houses and causing fires. The people of the town are running, holding their loved ones close to them as they evade the storm, seeking storm shelters and other places to hide. You see a man crushed inside a barn as it collapses while he tries to save his livestock. On the opposite horizon, you see the line of a force of marching men, and you know that they come to finish what the storm will leave. The storm rages, and the army marches, and all is laid in desolation. The fields of the town lay in burning ruins, what hasn’t been stolen has been destroyed. The harbor by the town is full of ships now caved in and sunken, little more than tombstones to the once mighty fleet that fished these shores. Once all passes, you see the survivors who start to crawling their way out of the ocean below. There is much weeping for that which was lost, much anger for the things that were taken. But after it, the people gather closer together to repair, to bury the dead, and to mourn together. It is full of sorrow, but the community comes together to bear it, and to move forward into the future. As you watch them recover, think of the time in your life when all was stripped away, when all was made bare and nothing but sorrow followed in its wake. That time passed, and if it has happened recently, it will pass. If there is a lesson in this card for you, in this death card meditation, record it in your journal and think on it, take comfort in it. The future is always brighter, and it’s always darkest before the dawn. How To Make A Spiritual Focus?